Glenmore Cottage self-catering only 1 hour from Dublin and Belfast. The award winning Glenmore Cottage is nestled in a quiet cul-de-sac at the foot of Slieve Foy, the highest peak of the Cooley Mountains. This charming cottage dates back to the 1800s, and boasts wonderful views of mountain and sea from its traditional half door. 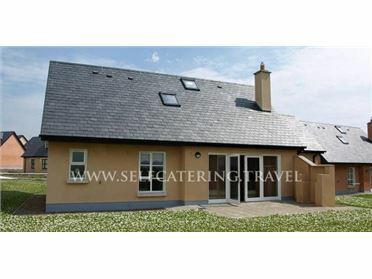 The Cottage will sleep seven people and holds the 3 Star award of Bord Failte (Irish Tourist Board). Local activities in the area include, hill walking, quiet road walking, golf, fishing, sailing and horse riding. This Vacation rental has all the modern conveniences including oil central heating. Built in traditional style, the cottage has a cosy sitting room with solid fuel stove, TV, Video, 3 bedrooms; 1 double bed, 1 double and single bed, 1 twin bed, 1 cot, a bathroom with shower, a shower room, 2 toilets and a newly fitted kitchen with dishwasher, washing machine/drier, fridge and microwave..